It has an extremely user friendly interface that requires almost no interaction. 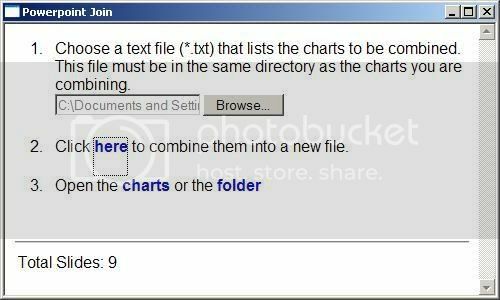 It works by using a text document that lists the PowerPoint document that should be combined. One thing I didn’t like about the program is the inability to add PowerPoint documents to a list and sort them the way the user wants, it would have been much better if such a feature was included. PowerPoint Joiner is a portable application, you can carry it anywhere in your pen drive. It also works perfectly on Windows XP Service Pack 3 and Vista.